The owners of the Home Port Restaurant announced this week that from now on they will only serve locally-caught fish and shellfish at the landmark Menemsha eatery known for its sunsets and swordfish. 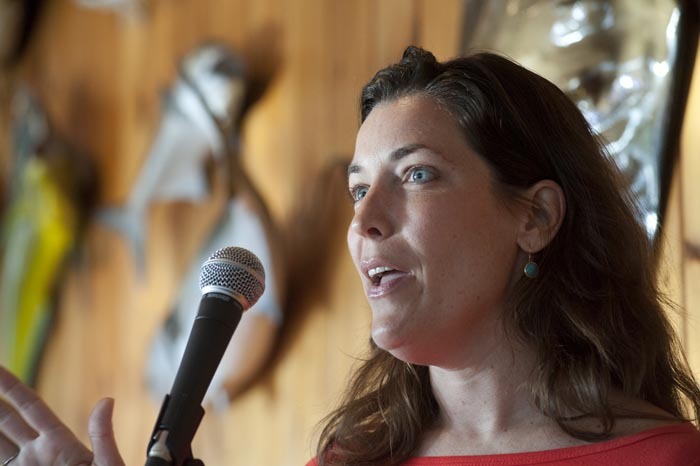 The sunsets will of course stay but swordfish will only be on the menu at the Home Port if it has been caught off the Vineyard, restaurant owner Sarah Guinan Nixon told a gathering of Island fishermen on Wednesday night. “You go out and do the hardest, toughest and most dangerous jobs, to bring bounty to our table. We want to be a friend to fishermen,” Mrs. Nixon said. The Nixons bought the 81-year-old restaurant three years ago, which is when they began hosting an annual dinner for the Martha’s Vineyard/Dukes County Fishermen’s Association at the outset of the season. This year the Wednesday night dinner featured locally-caught squid and black sea bass, and Mrs. Nixon introduced Teddy Diggs, the Home Port’s new chef. Mr. Diggs moved to the Island from Washington, D.C. where he said he had a lot of experience working with farmers in the area. He said consumers are more deliberate about what they eat and where it comes from. “I think what we will do is different but it will be good for the community,” he said. The Home Port opened for the season last night. Mrs. Nixon said she and her husband have learned a great deal in their three years of owning the restaurant and are acting on a vision they had when they began their venture as restaurant owners. “It is time to move on in our mission,” she said. The Home Port has a long tradition of providing summer jobs for Vineyarders, a tradition the Nixons plan to keep. But now much of the traditional fare on the old Home Port menu will be replaced. “We hope to have a more conservation-minded menu,” Mrs. Nixon said. Once abundant in summer in waters off the Vineyard more than 40 years ago, swordfish are now scarce. In 1998, a group of Atlantic coast seafood restaurants boycotted serving swordfish to protest the depletion of the resource. Three years later, new regulations were imposed which resulted in some improvement. However, swordfish, which are pelagic and migrate north to Canada, are rarely seen in Island waters. But there are plenty of other fish in the Vineyard’s sea. Fluke, also called summer flounder, have rebounded and will arrive on the docks in June. The commercial season for local striped bass begins July 12, although that fishery too is mired in controversy with new numbers out confirming severe declines in stocks and recreational fishermen pushing for a ban on commercial fishing of stripers. The commercial season for black sea bass closes at the end of this month and will reopen again in August. The bluefish season is open. Mrs. Nixon said the daily menu will be posted on a board. The Wednesday evening program included a presentation from an advocate for community fishermen. Brett Tolley of the Northwest Atlantic Marine Alliance, spoke of his organization’s campaign: Who Fishes Matters, highlighting the growing public concern about knowing where food comes from and suggesting that small fishermen can play a role. Warren Doty, president of the fishermen’s association, talked about efforts over the last year to advocate for Island fishermen, including activist work by the association to participate in the decision making around where offshore wind farms will be built. And there was good news about grant money. An ongoing project to coordinate the management of Menemsha Pond among Chilmark, Aquinnah and the Wampanoag Tribe of Gay Head (Aquinnah) has received funding from the U.S. Fish and Wildlife Service in the form of a $181,590 Tribal Wildlife Grant. The grant announcement was made by Brett Stearns, director of the natural resources department for the tribe. What a unique idea, a seafood restaurant that sells, uh, basically very little seafood. Tourists will LOVE that concept! Just checked out their on-line menu and am floored by the prices. Grilled island bluefish,...$40 wow,..Grilled Vegetable Lasagna,... $30,..ouch! I buy food for a living and I can confirm that these prices are beyond greedy. Bravo to Sarah and Bob, true practicing environmentalists who are in reality making a financial sacrifice with this responsible behavior. I think its a great idea. I think many Vineyard visitors (including myself), go out of their way to eat local, are willing to pay more to eat local, and will do whatever they can to support places that promote eating local. One more reason to go to the Home Port. We used to go to Homeport many, many years ago when the prices were still reasonable. We stopped going there a long time ago when it became too expensive. The food is good, but it is not worth the prices they charge.